MIT has a photogenic campus, what with Stata, the Dome, and the Charles. Today, however, Slice wants to feature an image from campus that is unique, not just in subject matter but also in technique. Several years ago photographer Greg Peverill-Conti captured this shot of an administrative building at MIT that was being torn down. He recently went back and reprocessed it, using a tilt-shift effect. Peverill-Conti says he’s hoping to produce a series of tilt-shifted MIT photos. You can try out the technique yourself, using either Photoshop, an iPhone app, or a good old (expensive) tilt-shift lens. If you want to try the Photoshop route, check out this tutorial on tilt-shift photography. Members of the MIT community have a history of transforming visual effects. Herbert Kalmus (1903) and MIT Physics Professor Daniel Comstock codeveloped Technicolor (yes, it was named after MIT) and Bill Warner ’80 created the Avid digital editing system. And now Eliot Mack SM ’96 hopes to add his name to the list. His portable Previzion system enables accurate matching of live-action foregrounds and computer-generated backgrounds so directors can see beyond a green screen at how the final shot will look. Watch video of the technology in action. To add backgrounds in post-production, technicians have to know exact camera positions and lens optical parameters used during filming. Currently, visual tracking involves 3,000-pound cranes fitted with rotary measuring devices that lack complete accuracy. Mack's invention puts Intersense optical-inertial and Airtrack inertial sensors onto the camera itself, which precisely record necessary data and eliminate the need to manually figure out tracking info. While green-screen technology is not new (meteorologists swear by it), creating live photorealistic images with it is. Current technology has problems accounting for motion tracking, image resolution, focusing and defocusing background shots, and capturing lens adjustment calibrations, which are crucial for post-production work. Mack has refined his technology to automatically generate camera tracking data and to not miss a single strand of hair against the backdrop. “Essentially, we’re recreating the world on the fly,” he says. So far, it’s been used on the television show V, the upcoming Tim Burton movie Alice in Wonderland, and the Knight Rider made-for-TV movie. Click photo to check out a video clip of MIT associate professor Erik Demaine from the show. Between the Folds, part of PBS’ Independent Lens series, spotlights ten masters of the art and science of origami, including MIT associate professor Erik Demaine and Brian Chan ’02, SM ’04, PhD ’09. Works from those featured on the program range from minimalist designs to paper caricatures reminiscent of Daumier and Picasso to creations using advanced computations. The result is a look at how the creativity inherent in origami blurs the lines between art and science. Check your local listings for air times. The show’s Web site also offers a history of origami and a Match the Folds game to see if you can discern the finished product from a fold pattern. 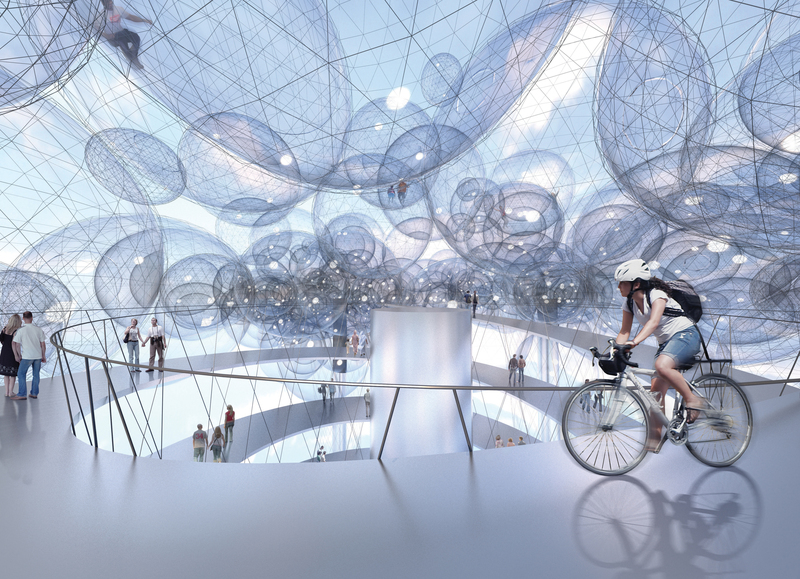 Though still a few years off, an international team of artists, architects, and engineers, which includes MIT professor Carlo Ratti, recently released plans for a 400-ft tall spherical cloud structure that would rest atop long, thin towers and be a center-piece of the 2012 London Olympics. In addition to being both structural elements and habitable spaces, the spherical units that make up the Cloud could be used to display real-time information about the games, crowd sizes, and weather. The plans call for them to be constructed out of a plastic called Ethylene tetrafluoroethylene (ETFE), which is the same material that was used to build the Beijing Aquatic Center. London mayor Boris Johnson put the Cloud on a shortlist of potential tourist attractions to be built in the Olympic Park. According to the BBC, he is still deciding if it will be built. Who doesn’t love a good pop-up book? And members of the MIT Media Lab’s High-Low Tech group have found a way to make them even better. Electronic Popables combine traditional pop-up mechanisms with thin, flexible, paper-based electronics (the circuitry is made with paint on the paper) to create an interactive book that sparkles, sings, reacts, and moves. The book was built by summer UROP student Jie Qi, who attends Columbia University, with assistance from Assistant Professor Leah Buechley, director of the High-Low Tech Group, and Tshen Chew ’11. The first video shows what the book can do. In the second, Buechley explains how it all works. For those Guy Fawkes/V for Vendetta devotees out there, here’s a little origami by master folder Brian Chan ’02, SM ’04, PhD ’09. Learn about Chan’s other work. Lauren McCarthy '08 wearing her Happiness Hat. Lauren McCarthy ’08 wants people to smile. Seriously. And she has just the tool—the Happiness Hat, a wearable conditioning device that encourages smiling through pain feedback. Kind of like a torture device with a heart. McCarthy, who received degrees in computer science and engineering and art and design at MIT, is a designer, artist, and programmer whose work explores the structures and systems of social interactions, identity, and self-representation. According to her Web site, “She is interested in the slightly uncomfortable moments when patterns are shifted, expectations are broken, and participants become aware of the system.” She works in a variety of media: video, performance, software, internet art, media installations, and, as seen here, interactive objects and environments.